A testament to the joy of living with pets and the sorrow of losing them. Written as a tribute to the dogs that I loved and lost. It will touch your heart and inspire you to embrace every magical moment you share with your furry friends. DOG WRITERS' ASSOCIATION OF AMERICA MAXWELL AWARD. “The book is most touching and deep with emotion and a true expression of grief and love. What a wonderful book. It brought tears to my eyes thinking about my Libby Love who we lost 3 years ago, but has gone to the RB with her pappy. This book is a must for anyone who has a furbaby. So heartwarming. "I Never Wanted to Say Goodbye, Revised Edition." It's utterly amazing how strangers can meet and just click. Like, another reviewer I was introduced to both Arlene and Scout,(Arlene's yorkie) via facebook. What a dynamic twosome!! I mentioned in a brief discussion the loss of my beloved pets Dread and Poopie. 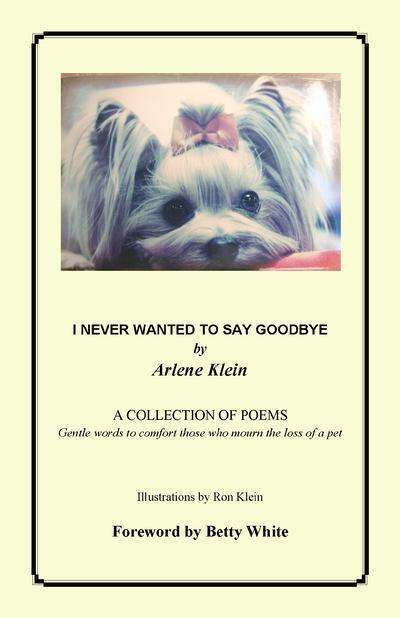 "I Never Wanted to Say Goodbye, Revised Edition is a collection of poems by Arlene Klein, The Designing Poet. They're written with an emotional depth of someone who has loved and loss a pet(s). Each poem is a well crafted tribute to her beloved pets. They're also a loving memorial to all pets who've made their transition. I hesitated to open the package once it arrived. I wondered if I would relive the excruciating pain of the past. Somehow,I summoned the courage and took the leap. Thank you, Arlene and Scout for creating such a wonderful and heartfelt read. If you own a pet, or know of someone who owns a pet purchase this maginicent book. It's a great gift. If you don't own a pet, purchase it for the poems alone. It was not but just a few weeks after the sudden illness and devastating loss of my beloved 13 yr Yorkie CHEWCH that I was introduced to Anne Klein on Facebook. After looking over her website and exchanging a few emails I began to feel as though I had found an Angel to help me with the grief, which at times seemed overwhelming. Oh I've cried!!! I have cried many many times because I have wanted my Yorkie back in my arms again !! How was I to deal with life without having my precious Chewch? I felt so scared, cold and alone; I felt guilty too. Did I do something wrong? Did I take care of him the best I could? And the most important and unnerving question.....did I make the right decision on euthenizing my Best Friend??? Well if you have lost a pet, or as in my case had a pet and as they've aged, became dreadfully fearful in the anticipation and uncertainty of euthenasia, you will truly find comfort in reading this remarkable collection of Poems. Each speak to the heart. It put pet ownership in a healthy persepctive and made me feel that I was not alone;that Arlene felt the same pain I did but turned her grief magically into heartwarming poetry, so that others may find peaceful refuge. I finished this book with a feeling of so much appreciation for pets. Arlene has a gift for telling you about her experiences and emotions while allowing you to make them your own.